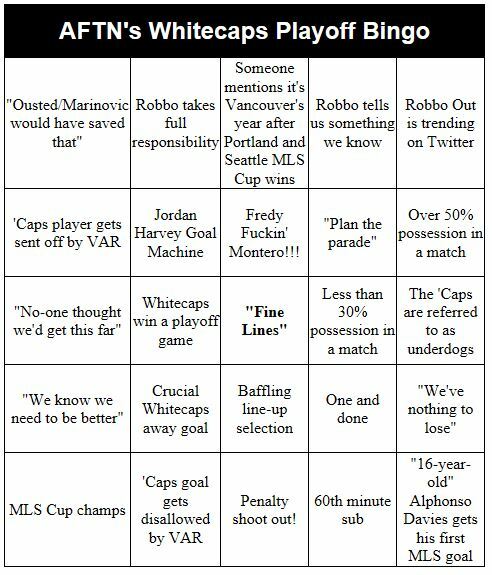 AFTN’s Vancouver Whitecaps Playoff Bingo! The playoffs are almost upon us! After missing out last year, the Whitecaps are back in the postseason and raring to go. Can they win their first ever playoff game? Will they be one and done? Are we looking at Canada’s first ever MLS Cup champs? So many questions. So much fun to be had. But not enough. We simply had to add to it, resurrecting and revamping our previous Whitecaps bingo card, with a special playoff edition. Guaranteed to add excitement to your ‘Caps playoff experience. Whether near or far. At the game or in the bar. Get your pens primed. It’s Bingo time! 25 squares of Vancouver Whitecaps fun. How many will you be able to cross off this playoff campaign? Will you be able to complete your card in just one match or will you need to carry it on to the semi-finals? Will there even be semi-finals? We’ve not made it easy, but we have given you “Fine Lines” as the free square. That one should be a given. In fact some of them might be quite the stretch for you to be able to cross off. So eyes down and ears open at training, radio and television hits, and Whitecaps matches. 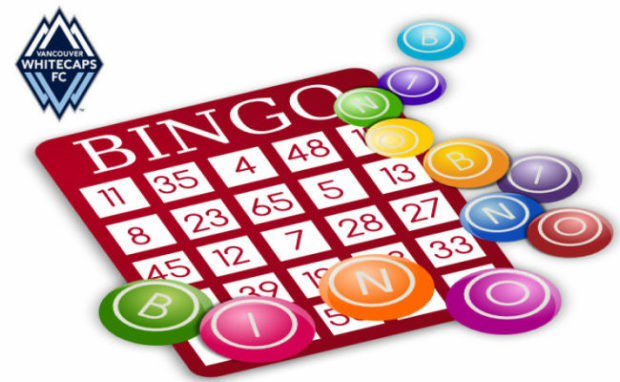 You can use the card we’ve provided here, or for even more fun and frolics, head along to HERE and you can print off any number of random generated Bingo Cards to play along with all your friends and family. Did someone say Wreck Beach Bingo Party? Probably not, but don’t be shy, give it a try. Fun for kids and the young at heart of all ages, and guaranteed to be a load of balls.